Born September 12, 1957 in Hirosaki, Aomori Prefecture, Sato-san majored in philosophy at the University of Tokyo (1982). He first worked in film as assistant director for Innocent Sea: Minamata 1982 (directed by Katori Naotaka). In 1989, he began living communally in the mountains of Niigata with a film crew of seven to direct Living on the River Agano. The film, completed in 1992, won the gold medal at the Nyon Film Festival and the Grand Prize at Sundance in Tokyo. He directed many documentaries, including Artists in Wonderland (1998, Siglo), Self and Others (2000, Eurospace), and Hanako (2001, Siglo). His film Agano Memories (2004, Kasama Films) was a reflective return to Niigata 10 years after his first film was made. His last film, Out of Place: Memories of Edward Said (2005, Siglo), was named best documentary at the prestigious Mainichi Film Awards in February 2007. 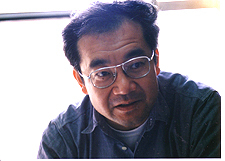 In addition to directing films, Sato-san was chief lecturer in the documentary program at the Film School of Tokyo and professor of theatrical arts at the Kyoto University of Art and Design. In 2002, he spent a year in England as a Ministry of Education overseas fellow. He also produced television programs, edited films, and wrote books on film theory. His books of essays and criticism include The Horizon of Documentary Film. He was a member of the board of directors of the Directors Guild of Japan and contributed in a variety of capacities to the Yamagata International Documentary Film Festival and the film program at the Athénée Français Cultural Center in Tokyo. Sato Makoto died on September 4, 2007. He was 49 years old.